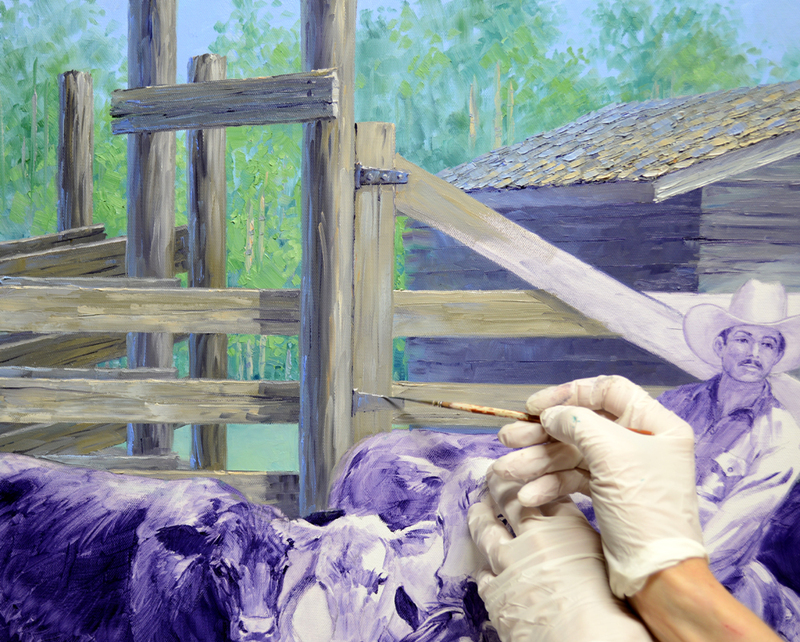 All of the posts and boards are painted with various combinations of MUD (2 parts Ultramarine Blue + 1 part Alizarin Crimson) + Cadmium Orange + Ultramarine Blue + White. 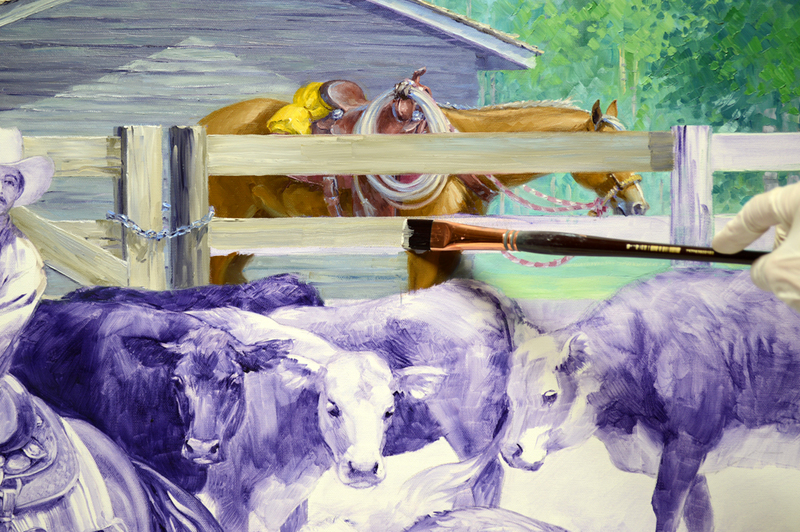 The loading chute in the back is made darker so it will contrast with the sunlit fence in the foreground. 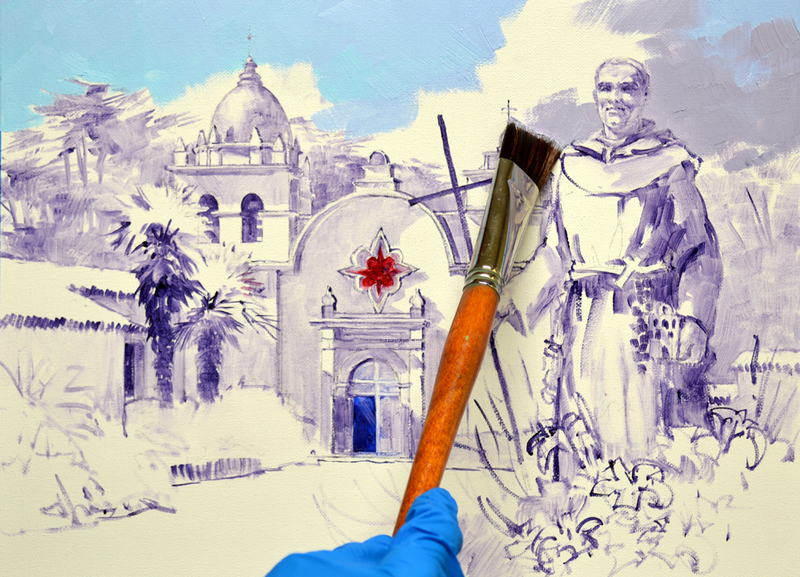 A stroke of White + Ultramarine Blue is made along the edge of the shadow side of the posts. This helps to give them the appearance of ’roundness’. 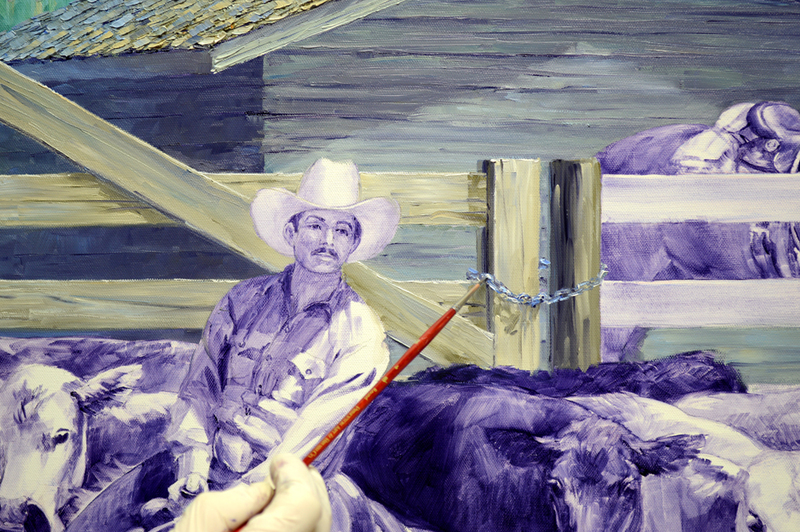 Please keep in mind, the blue looks brighter in these digital images that it actually is on the painting. Hinges are added on the gate. 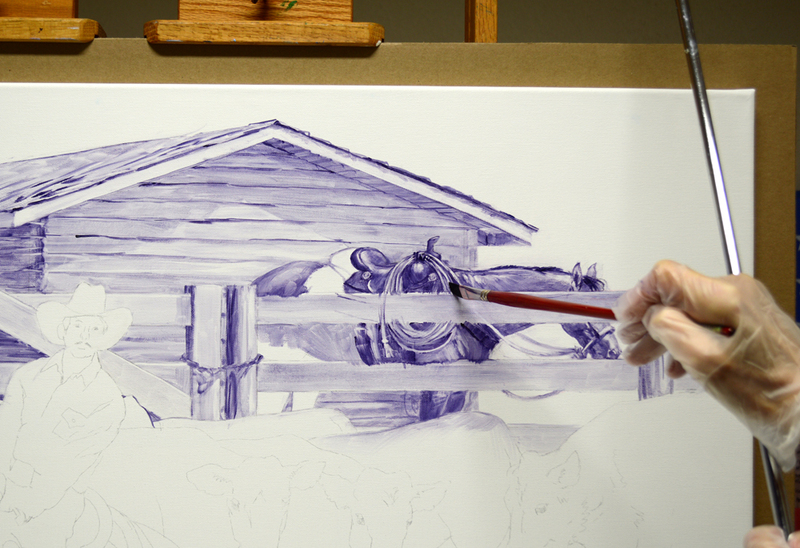 Since the washed in part of the canvas is now dry, I can safely brace my left hand there to steady my right as I work on the fine detail. As you read through my blog, please remember: You may click on any of the pictures to view them larger. A heavy chain holds the gate securely closed. 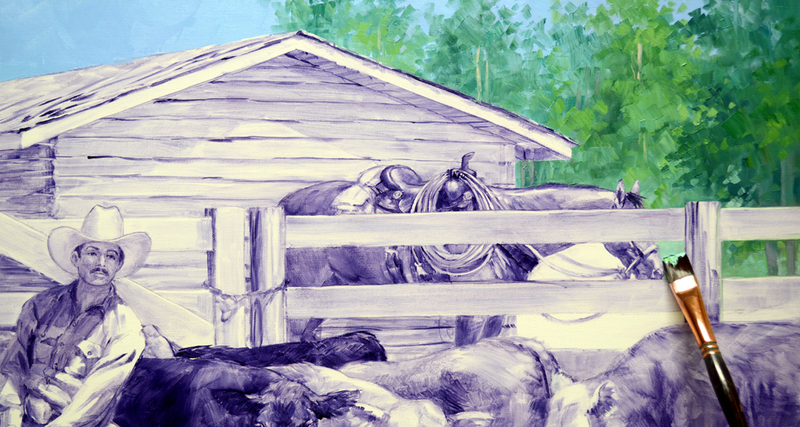 Before I can paint the fence on the right, I’ll need to do the horse resting behind it! Since Chesty is a dark bay I’m going the make this one a flaxen maned sorrel. Having established all the details of the highlights on her shiny coat in the initial wash-in makes this cow pony much easier to paint. 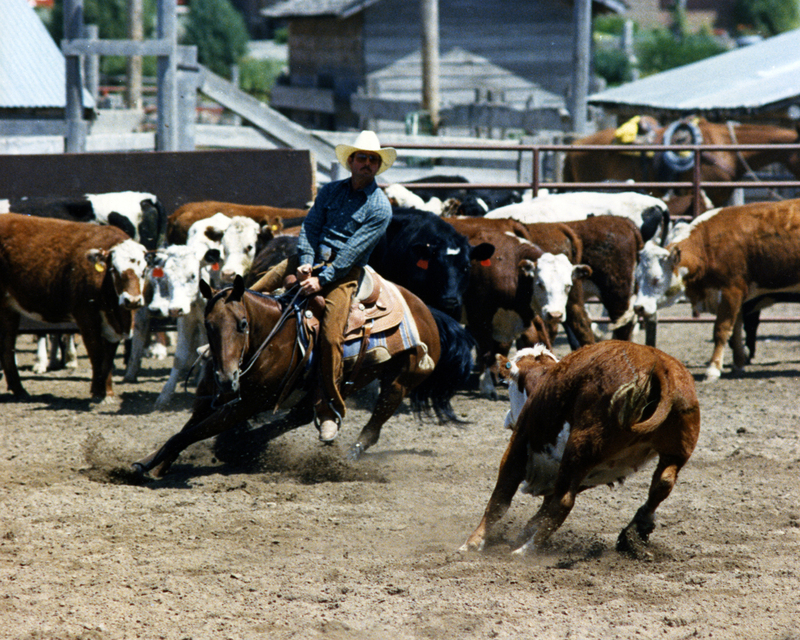 A yellow slicker is tied to the back of the saddle. I may have to come back later and tone it down a bit. 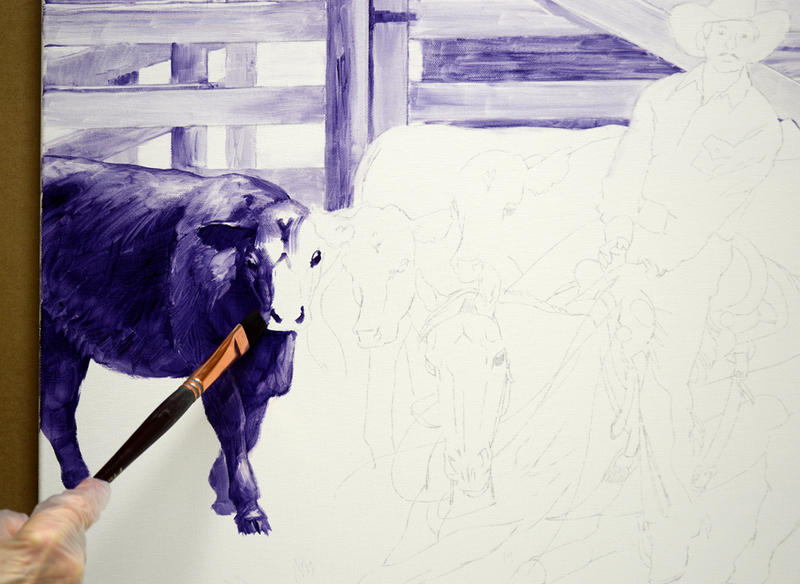 But I want to get the rest of the painting finished before I decide. Once all the foreground is complete the rain coat may not appear as bright. The rope is first blocked in with darker tones left over from the distant building. Then I come back to accentuate the portions of the rope highlighted by the sun. 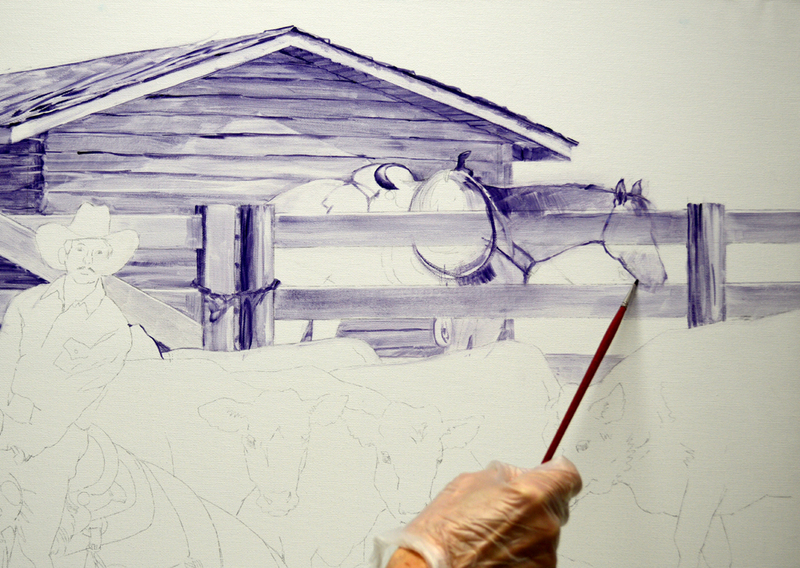 My right wrist is braced against the mahl stick to give me a steady support as I make the curved brushstrokes. 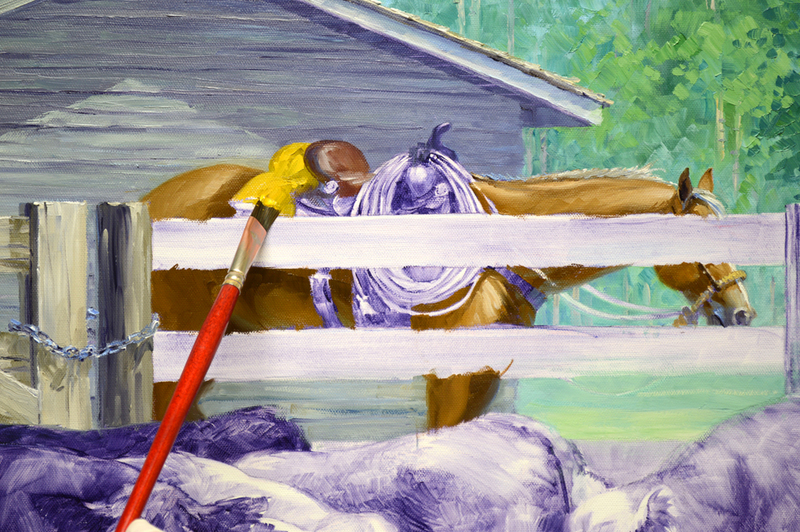 Now the horse and tack are done I can paint the rough boards of the fence over her! 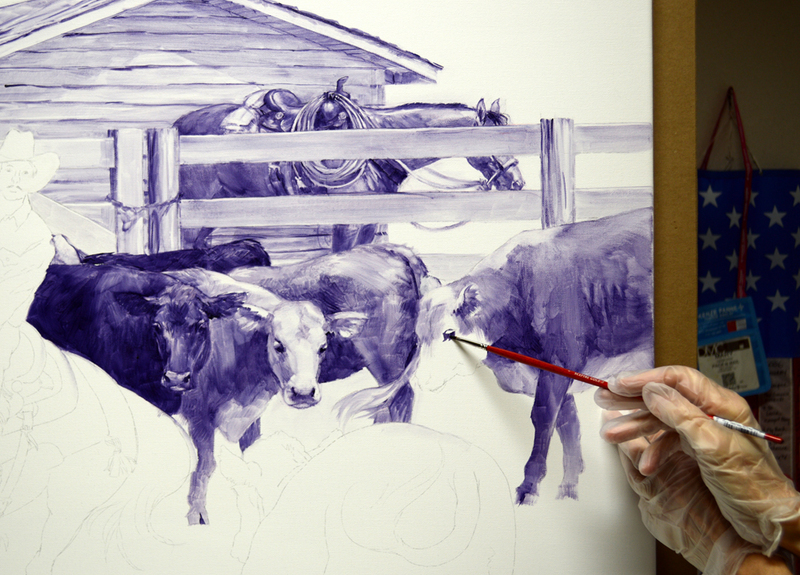 We’ll begin applying opaque oil paint in the background. My color recipes are as follows: #1. 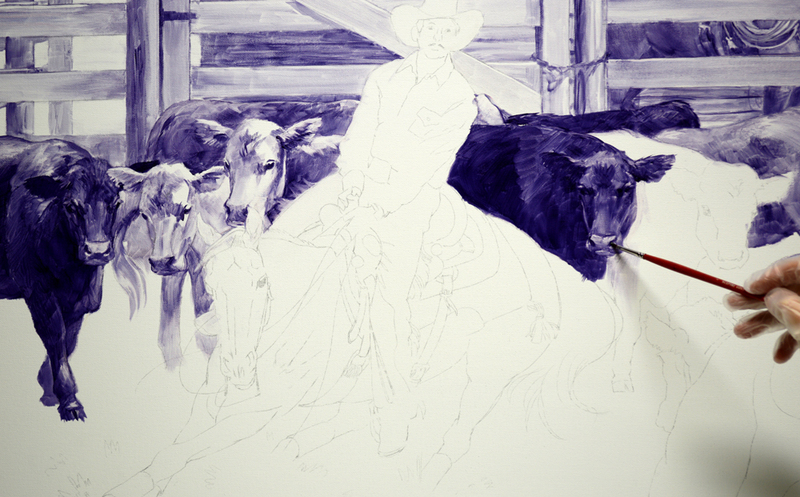 MUD (2 parts Ultramarine Blue + 1 part Alizarin Crimson) + more Ultramarine Blue + Cadmium Orange + White. #2. Two shades of Pthalo Blue + Ultramarine Blue + MUD + Cadmium Orange + White. The lighter mixture has more White. #3. Three mixes in different proportions of Ultramarine Blue + Lemon Yellow + White. #4. White + Pthalo Blue. #5. 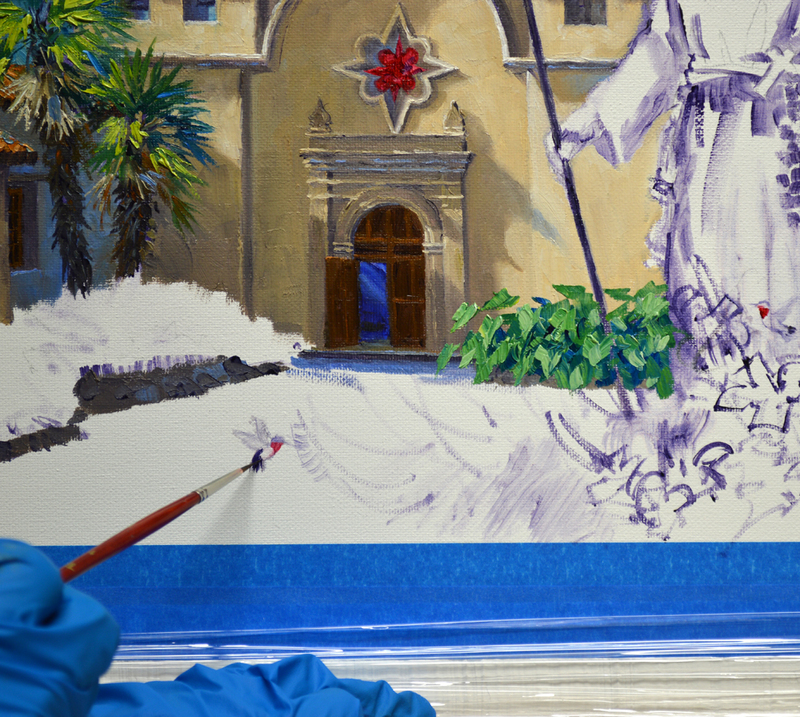 White + Cobalt Blue, this mixture is just a little bit darker than mix #4. 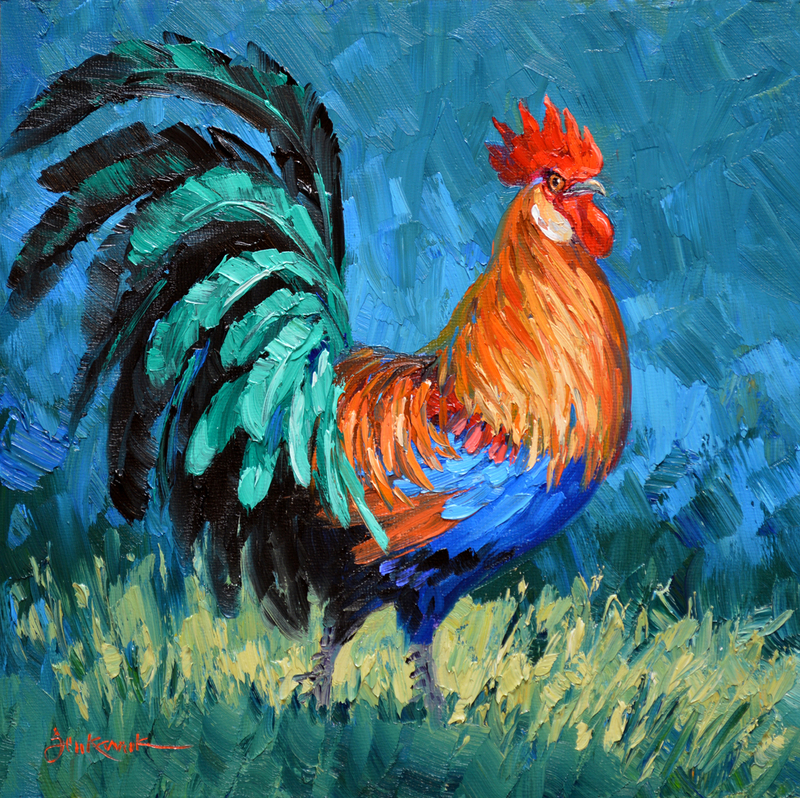 If you would like to learn more about our Double Primary Color Mixing System that Jack developed CLICK HERE. Even though the background will be filled with Birch Trees I completely cover the sky first. 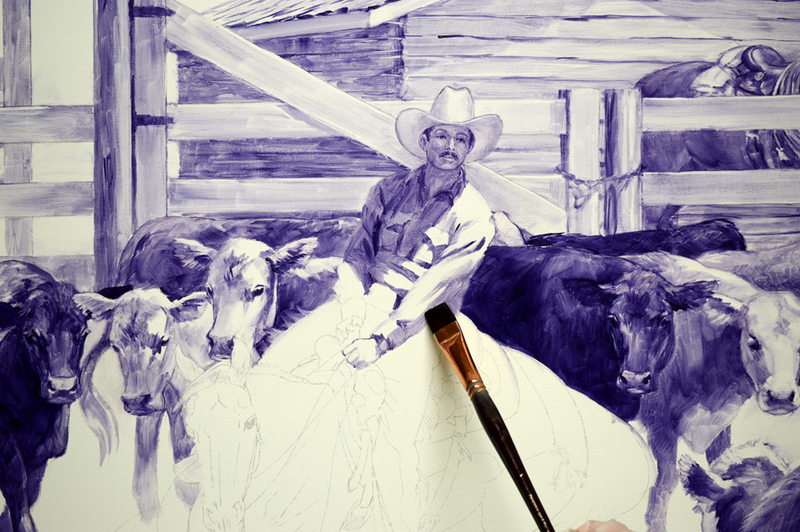 Mix #5, the darker of the two blues, is used along the top of the canvas. The sky becomes lighter as we drop down, nearer the fence line. 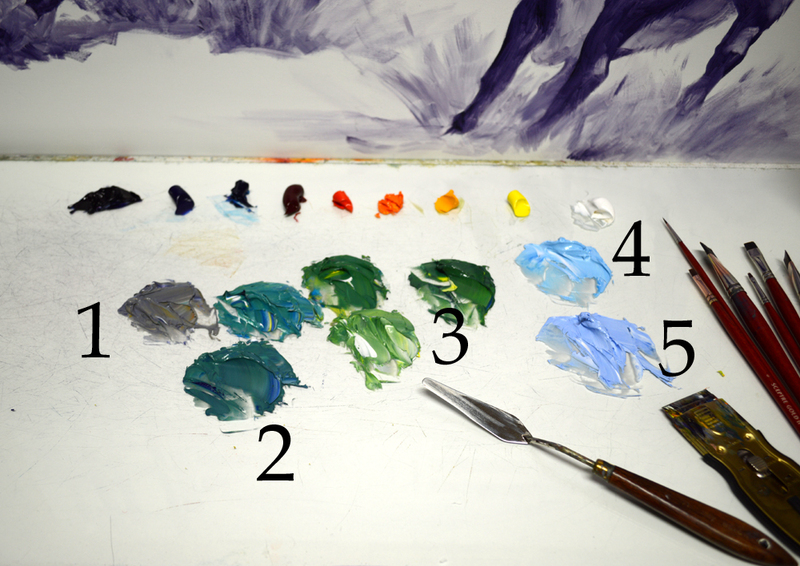 The Pthalo Blue mix #4 is used for the lower portion of the sky. The trees are painted, wet-into-wet, over the blue field of the sky. This technique softens, or mutes, the trees and makes them recede. At the right edge of the canvas I place some trees in shadow. Sunlight pouring into the painting from the right, coming in behind the darker mass of trees, helps to give the feeling of distance. Please keep in mind, you may click on any of the pictures to view them larger. The weathered, grey boards of the outbuilding are painted with several combinations of MUD + Ultramarine Blue + Cadmium Orange + White. The portions of the walls in shadow are blocked in first. More MUD is added to the wall mixture to indicate crevices between the old boards. 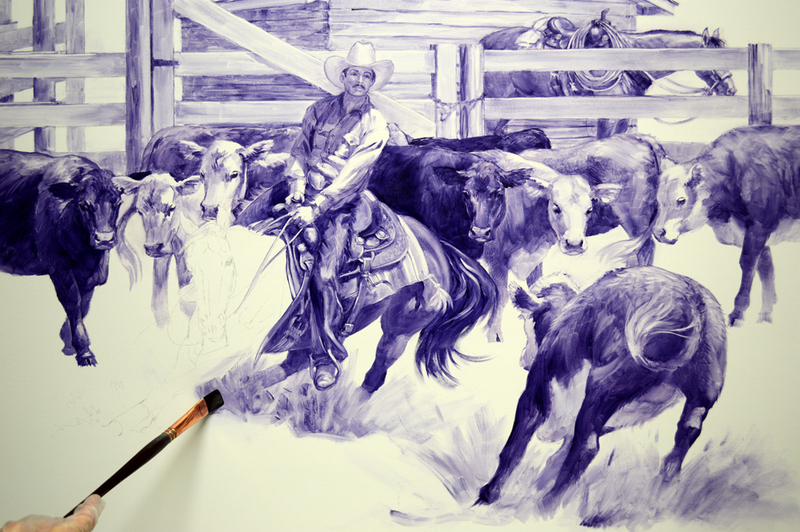 This is a complicated piece, its just takes awhile to do the initial oil wash value drawing. 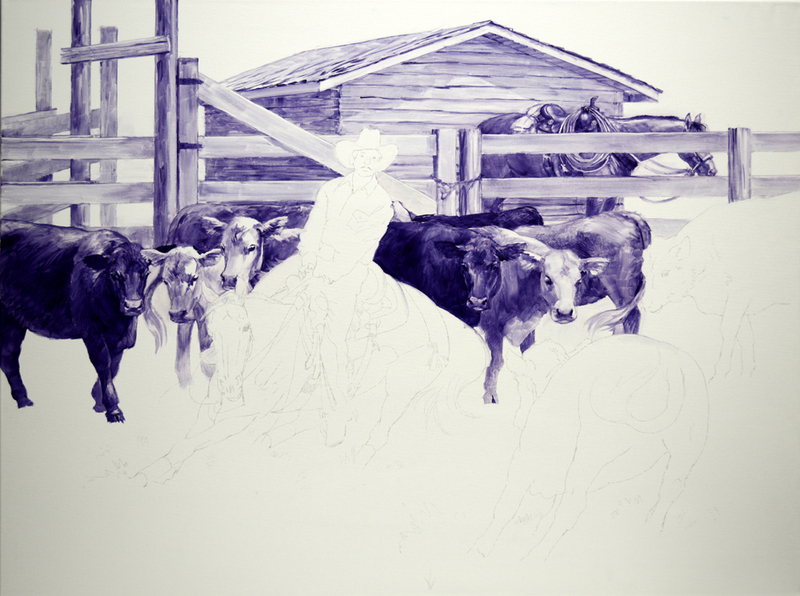 Work continues on the cattle. Moving to the foreground I begin washing in the cow that Chesty is cutting from the herd. Dust she kicks up will add to the action in the painting. My next task is Bill’s face. You can see in my reference picture that he has sunglasses on. You may click on the image, or any of the others, to see enlargements. Bill had another picture, taken at a different competition, without sunglasses. So I’m referring to it as I render his face. His face looks dark right now but it’s in the shadow of his straw cowboy hat. Once Bill’s shirt is finished it won’t appear as dark. At this stage I’m not concerned about getting an exact likeness, just an approximation. My main goal right now is to get the light and dark values, or shading, correct. Now that the dark shadows on the shirt are getting washed in, Bill’s face looks much lighter! What a beautiful saddle. The pocket on the skirt is just right for carrying a hoof pick. I imagine these days saddle makers are being asked to put pockets for cell phones on their custom creations! With all the dirt being kicked up I don’t have to worry about hooves, pasterns and fetlocks! All of that detail is concealed by the flying dust. 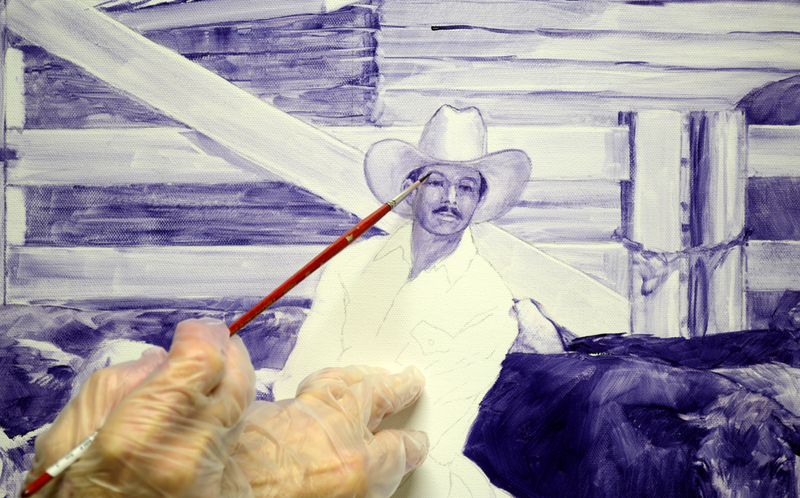 A thin oil wash of MUD (2 parts Ultramarine Blue + 1 part Alizarin Crimson) + Liquin is used to begin establishing the light and dark values of the painting. 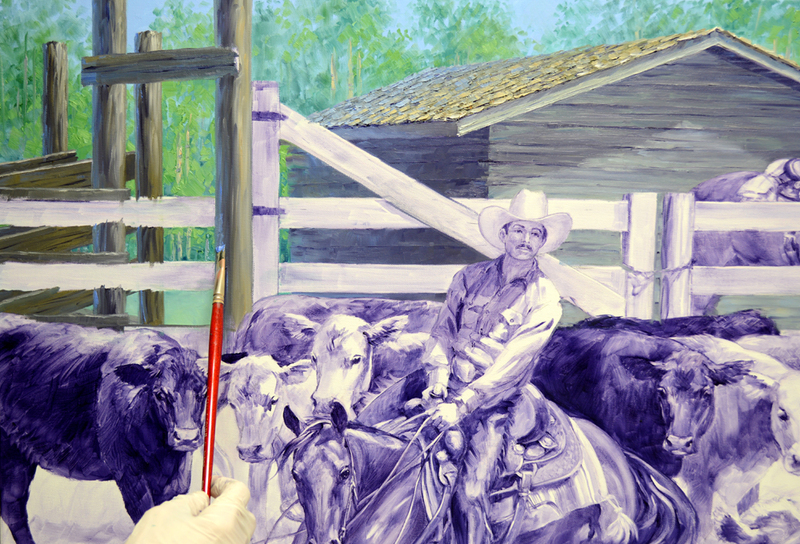 This stage allows me to make certain I have all the proportions and composition correct before applying opaque oil color. 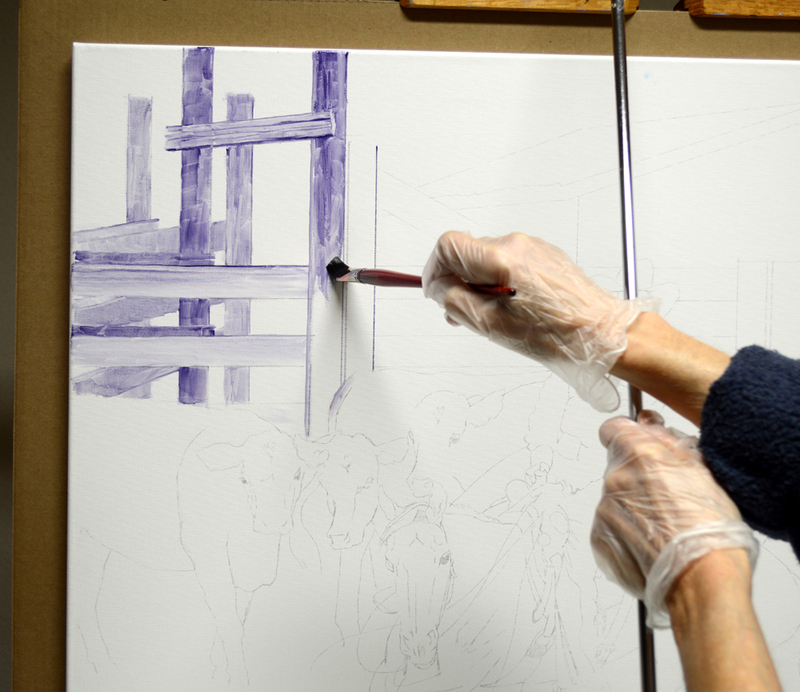 Bracing my wrist on the mahl stick hooked over the top of my easel steadies my hand, enabling me to make the posts straight. Please remember as you read through my blog, you may click on any of the images to view them larger. The canvas has been attached to a sheet of double ply cardboard, you can see it extending around the outside of the piece. This will make it much easier to handle the painting when the edges are wet. 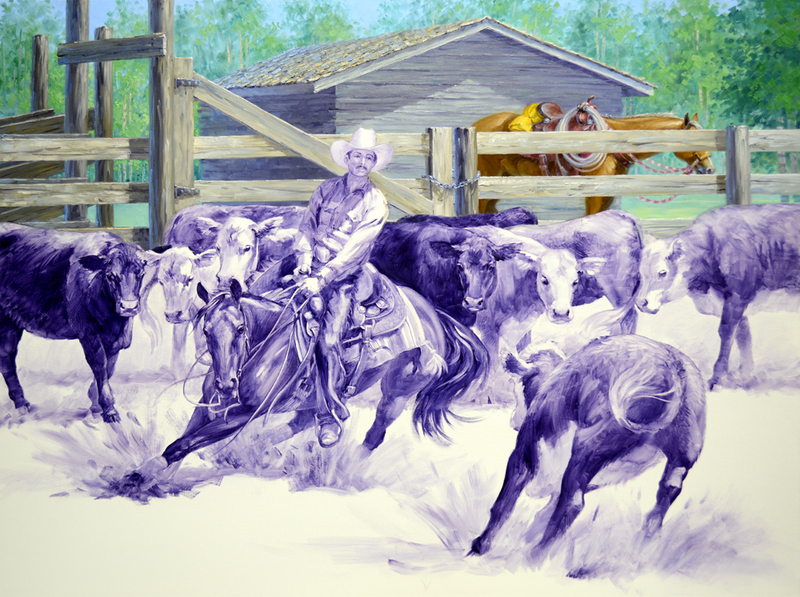 If you’d like to see how this was done with a similar canvas CLICK HERE. OPPPSSS! 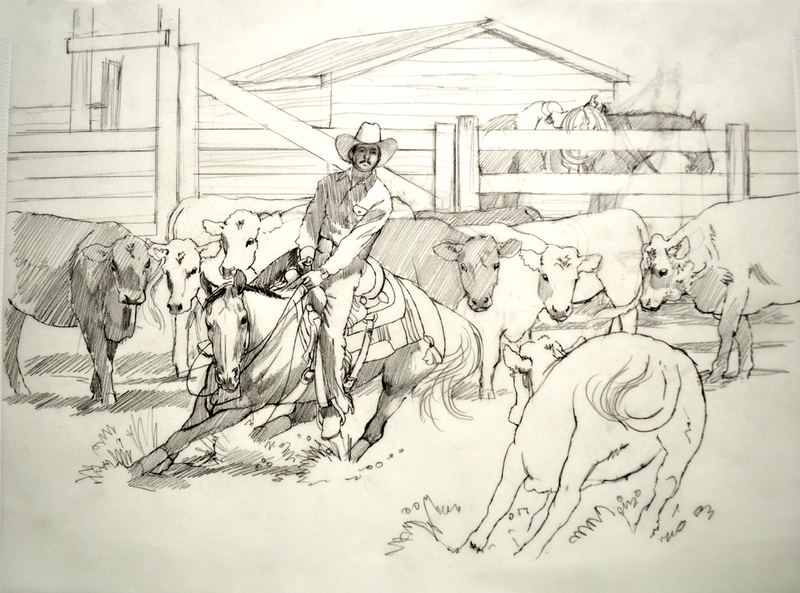 I realize the neck of the horse in the background is too long in my transferred drawing. 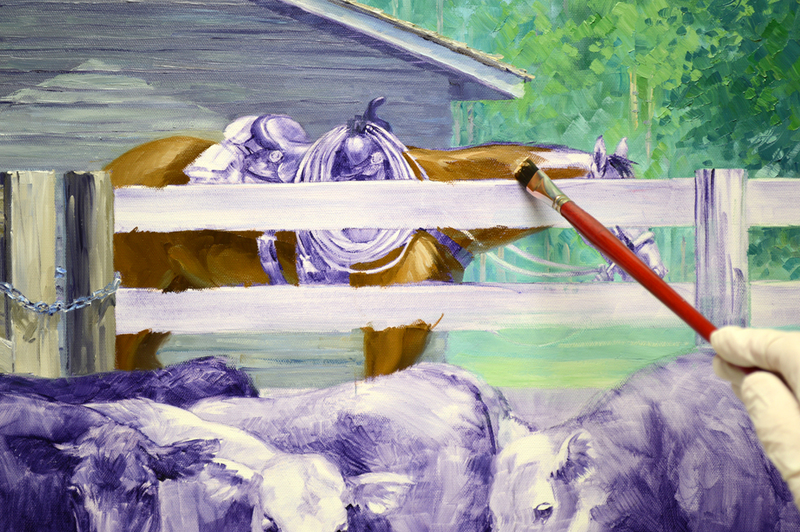 So I correct the horse’s anatomy, going ahead and drawing him in as if the boards of the fence aren’t there. 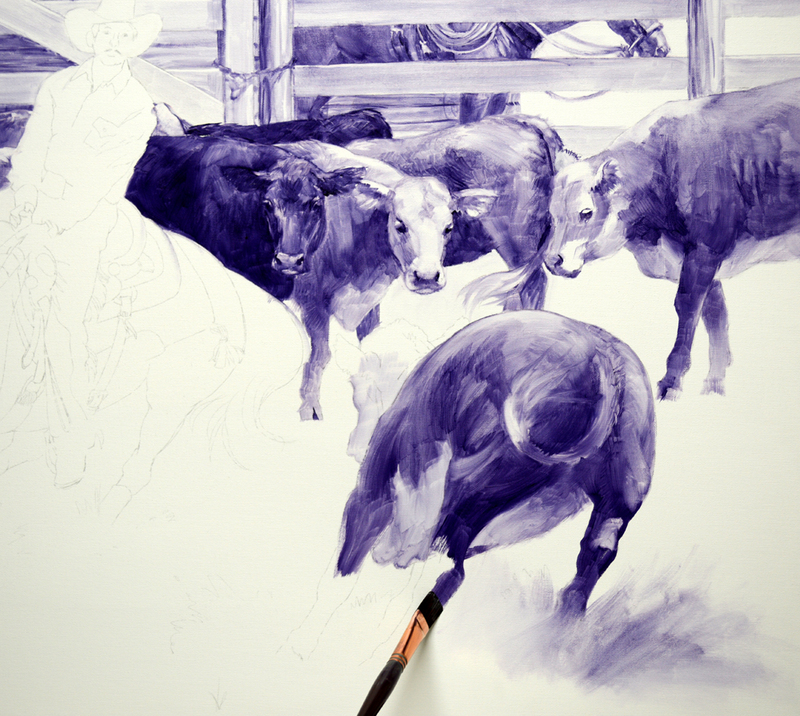 Once I am sure everything is right I’ll take a clean brush, dip it in thinner and wipe out the lines in the boards. 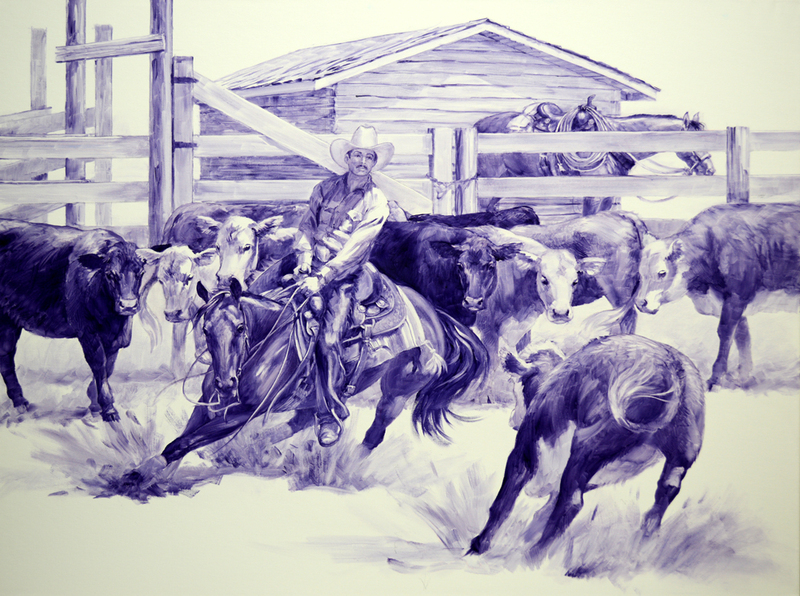 It’s so fun to add the details of the saddle and rope. 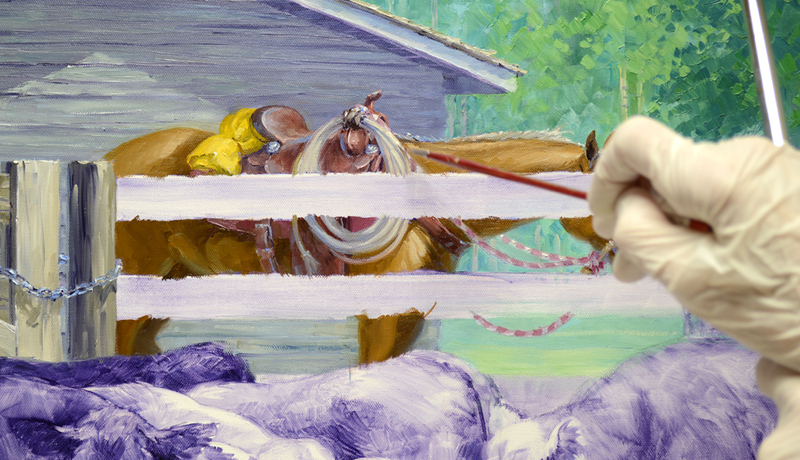 The rope was washed in with a medium tone, then the highlights on it are ‘lifted off’ with a clean brush. 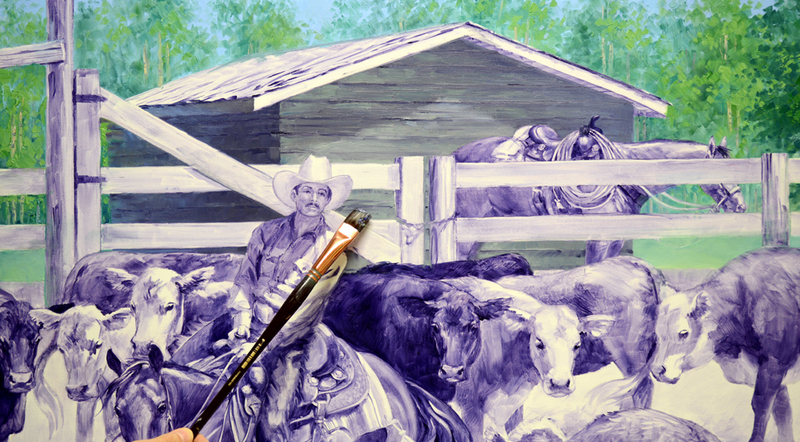 Bill and I decided to make the mix of cattle Black Angus and white face Herefords. It must have still been cold at night in this part of the country when the original picture was taken, the cattle are slightly wooly. The texture of their coats will be a nice contrast to Chesty’s sleek shiny coat. Since Chesty is a deep bay we felt a Black Angus directly behind her hip would help to separate her from the Herefords. The white faces of the cows behind her dark head will accentuate it! Before we get started on my newest piece I’d like to take a moment to thank ALL of you for your wonderful comments about our studio garden. I feel so blessed to have such a pleasant place to relax and enjoy the beauty of Our Lord. And even more blessed to have such fabulous readers and friends. YOU ARE SPECIAL! The photo of this beautiful mare, Nu Bar Pleasure, was taken in 1987. 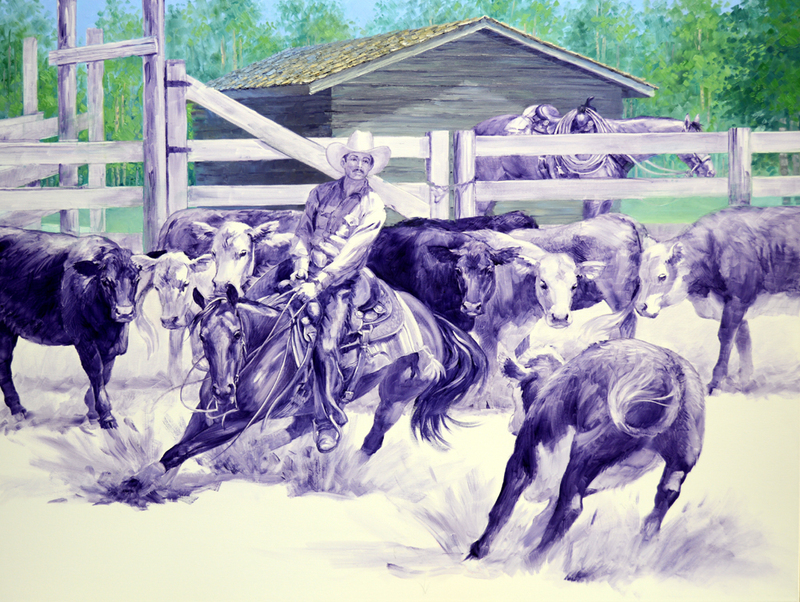 Her owner, riding her in the picture, has commissioned me to paint “Chesty’s” portrait. 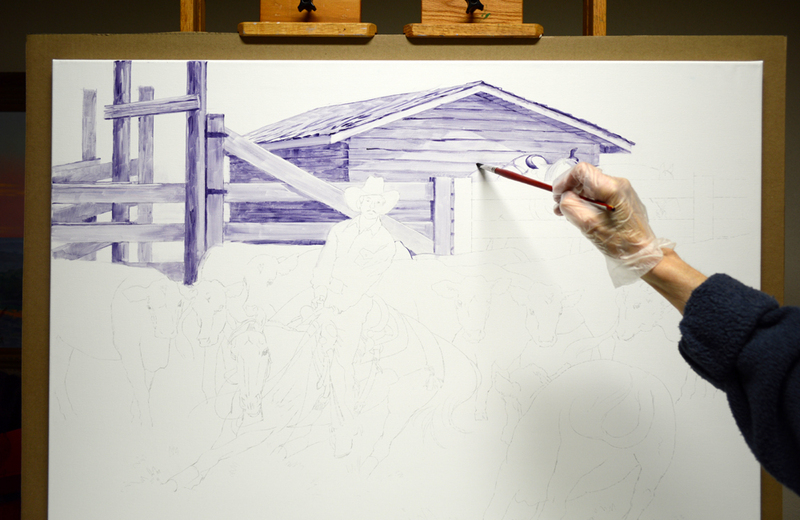 VIDEO DEMONSTRATION: Transferring the small sketch to the large canvas. 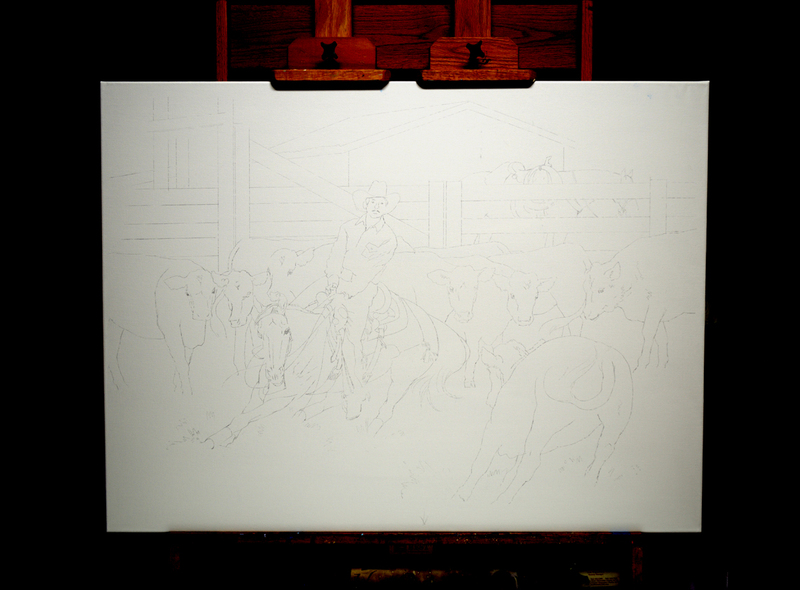 The initial outline of the composition is now transferred on to the canvas. You may have to enlarge to picture to see it more clearly, just click on the image. 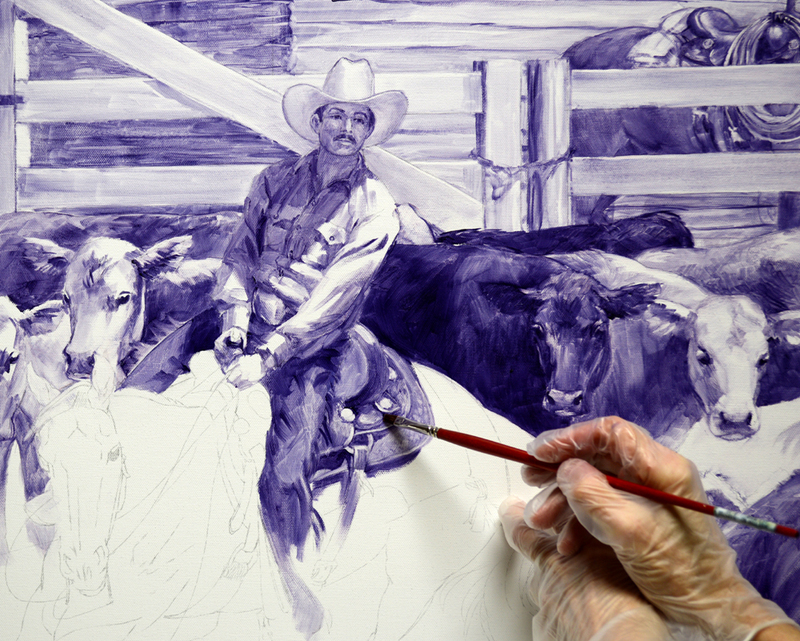 This light drawing provides a “Road Map” for me to follow as I begin washing in the basic values of the painting with an oil mixture. We’ll start that in our next session, hope you’ll come follow along. If you would like to receive an email every time I publish a new post please feel free to subscribe to my blog. CLICK THIS LINK and scroll to the upper right side of the page. You will see a heading EMAIL SUBSCRIPTIONS. Just enter your email address and click the button “Sign me up!” It’s easy. 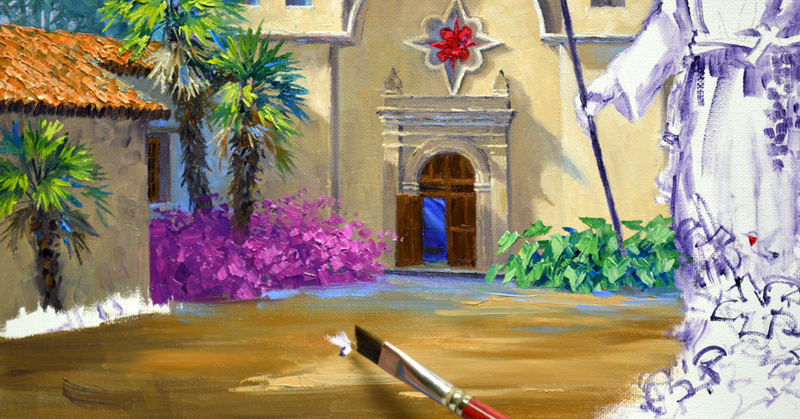 A SECRET SURPRISE commission is up on my easel right now, I don’t dare show it on the blog. 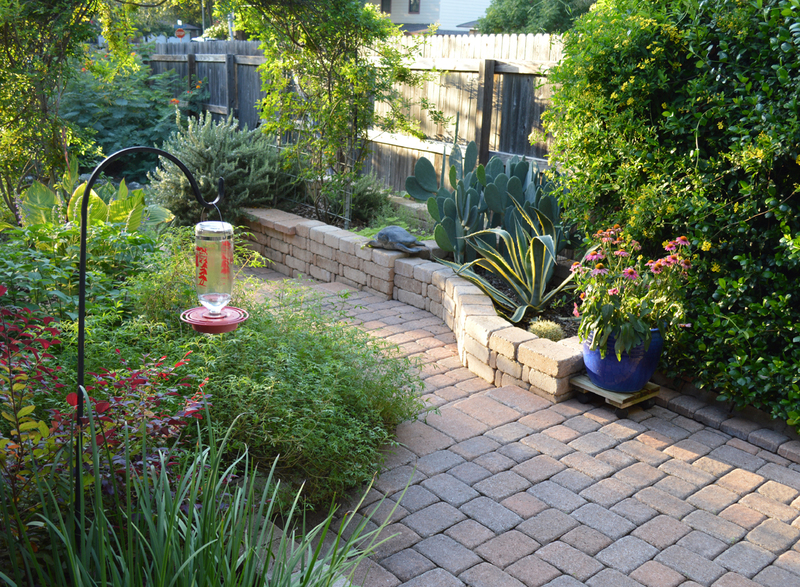 Instead I’ve decided to share some pictures of our garden. In September we had a record amount of rainfall, the garden has totally transformed from its bedraggled, hot summer doldrums. 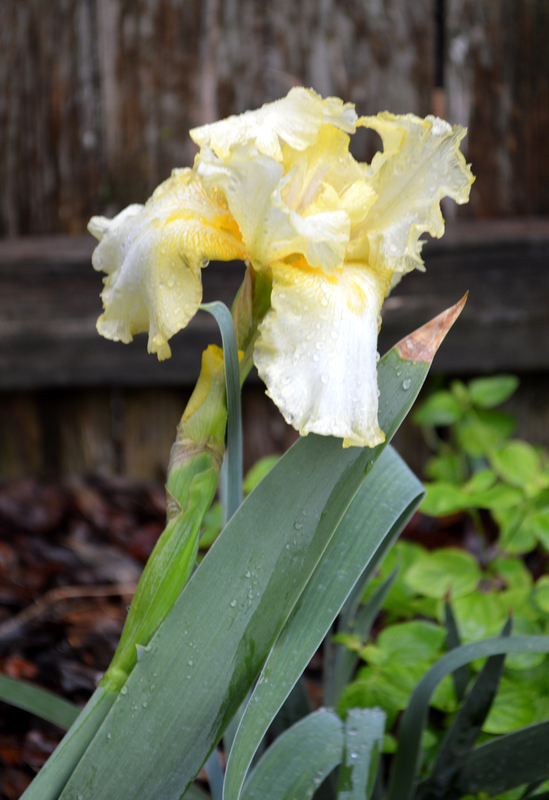 The other morning I couldn’t believe it when I discovered one of the Irises had a flower! I thought they only bloomed in the spring. 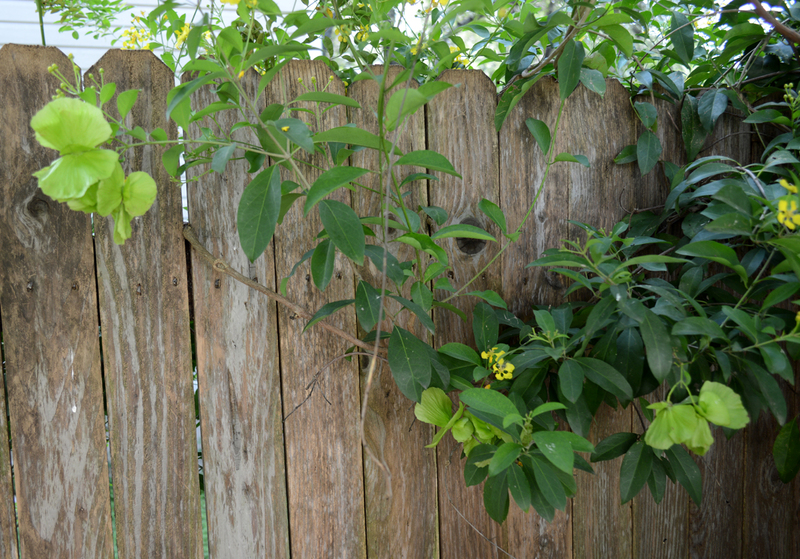 The Butterfly Vine, covered in delicate yellow blossoms, is putting on a show! The vine got its name from the seed pods which resemble butterflies! To view this, or any of the other images, larger just click on the picture. 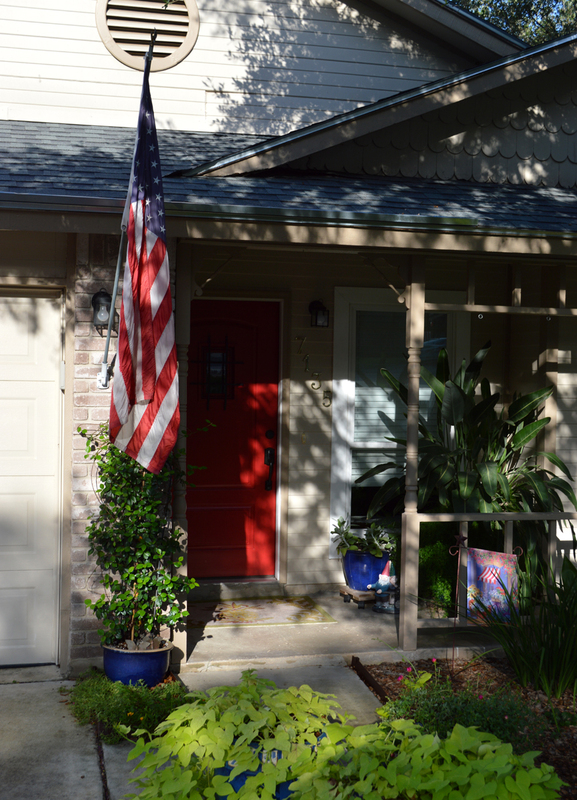 That’s another Butterfly Vine by the deck on the right. 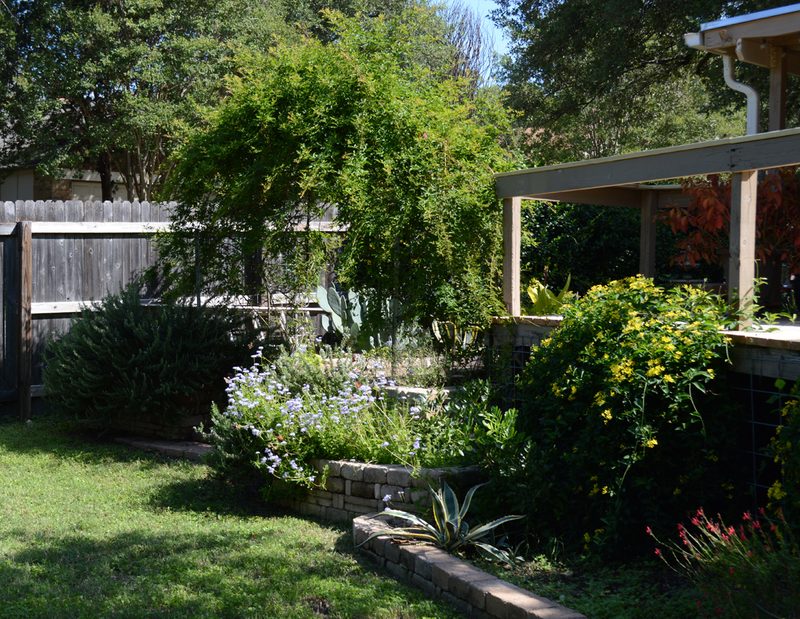 Notice the flowers in the center bed, just below the arbor, they’re called “Blue Mist”. And how cool is this? 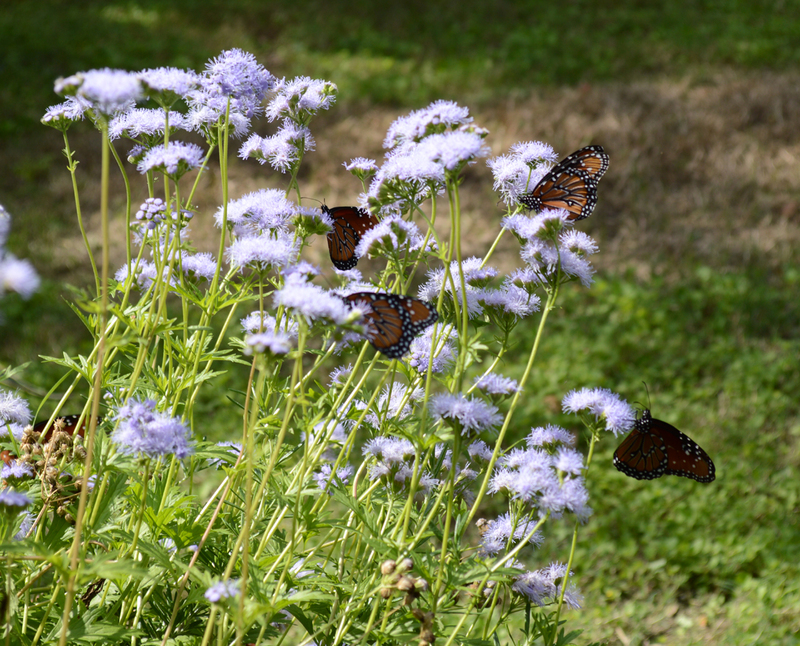 Since we’ve been talking about Butterflies, the Blue Mist is covered with beautiful Monarchs! 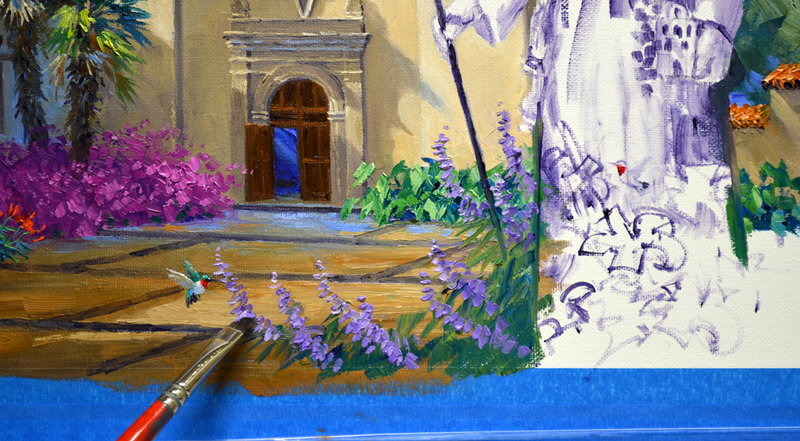 The fountain courtyard is such a pleasant retreat; a quiet place to take a break from painting, sit and listen to the music of the splashing water. 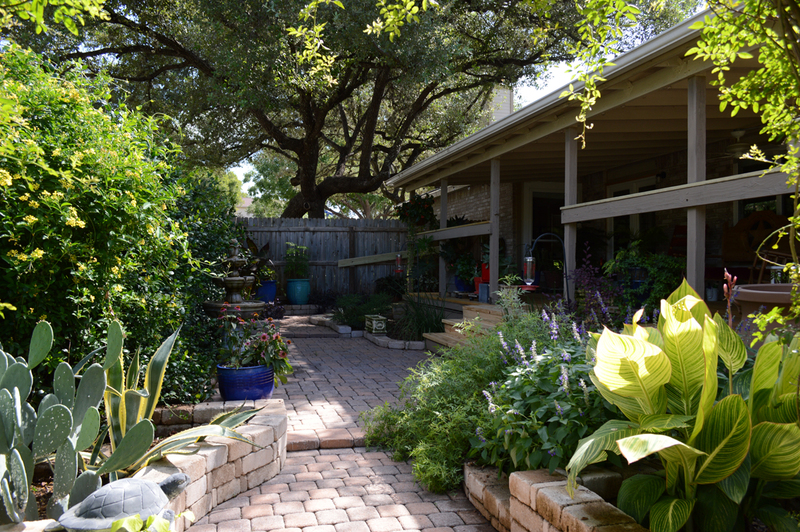 The broad leaved plant on the right, a Tiger Tropicana Canna Lily, is a new addition to the garden this year. The yellow green foliage looks wonderful next to the purple Salvia. Hummingbirds zip from flowers to feeders; a true delight to watch. 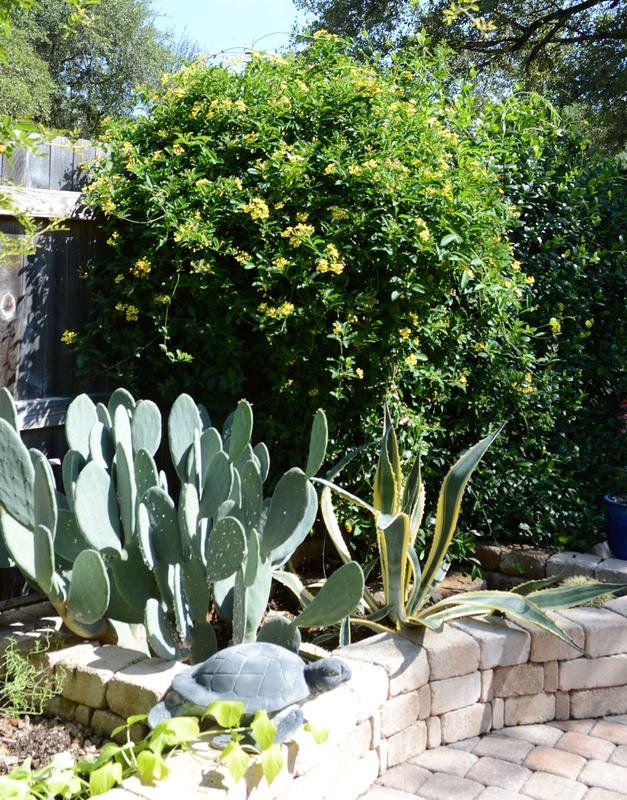 My heart smiles when I’m out in the garden, enjoying the wonder of God’s beauty. I have to CROW a little bit! I don’t know if you realized it but I offer PRINTS on my website. Prices start at ONLY $27! 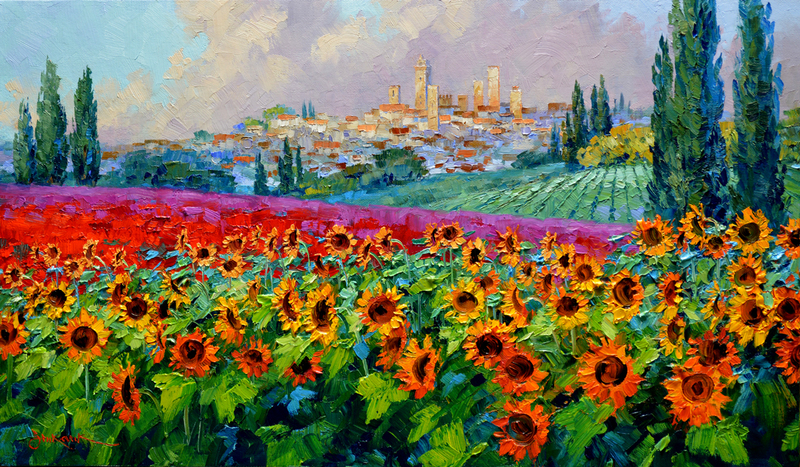 I’ve ordered some of these for myself and they are beautiful, very high quality reproductions. There are three pages on my website to browse, enabling you to select just the right piece or pieces for your home. One of the coolest decorating trends right now is to group several smaller pieces together on a wall! I have collectors who even hang my artwork in their bathroom! All images are available in different formats from PRINTS on paper, canvas and wood. My pieces can even be printed on acrylic or metal panels! Also, you may order them framed or unframed. You have LOTS OF CHOICES, let your imagination run free. These are just a few of the images available. AND…I’ve just added some new ones so if you’ve visited my PRINTS page before you need to check it out again. Prices begin at ONLY $27. 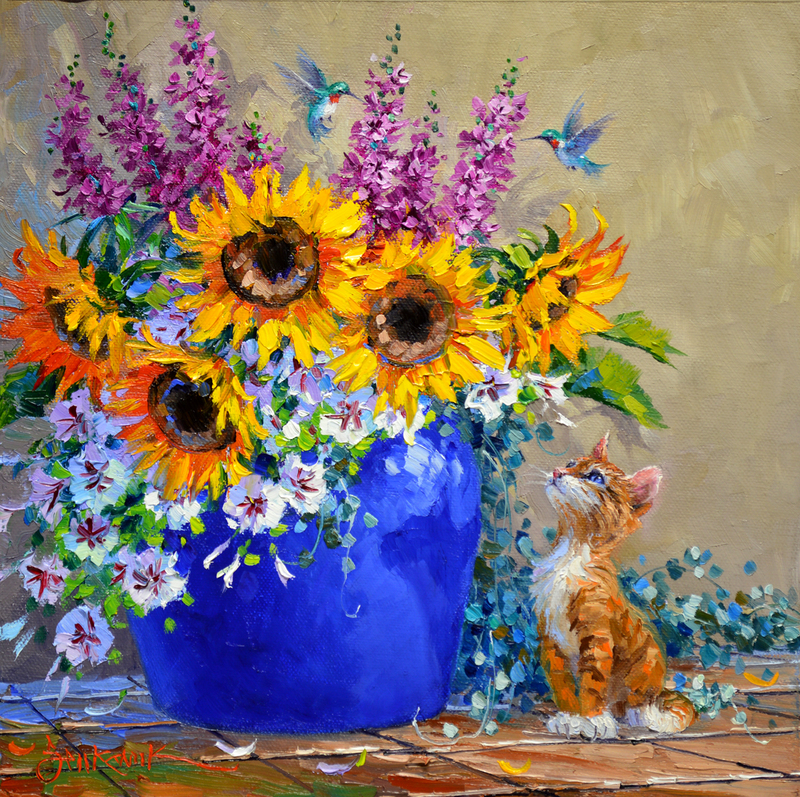 These high quality reproductions of my paintings make wonderful gifts for someone special or maybe even for yourself. Remember, a Senkarik Artwork is a gift that brings smiles long after flowers and candy are gone! Salvia, or Mexican Bush Sage, provides a delicious treat for our Hummingbird friend. The tall blooms are painted with mixtures of Dioxazine Purple + White. 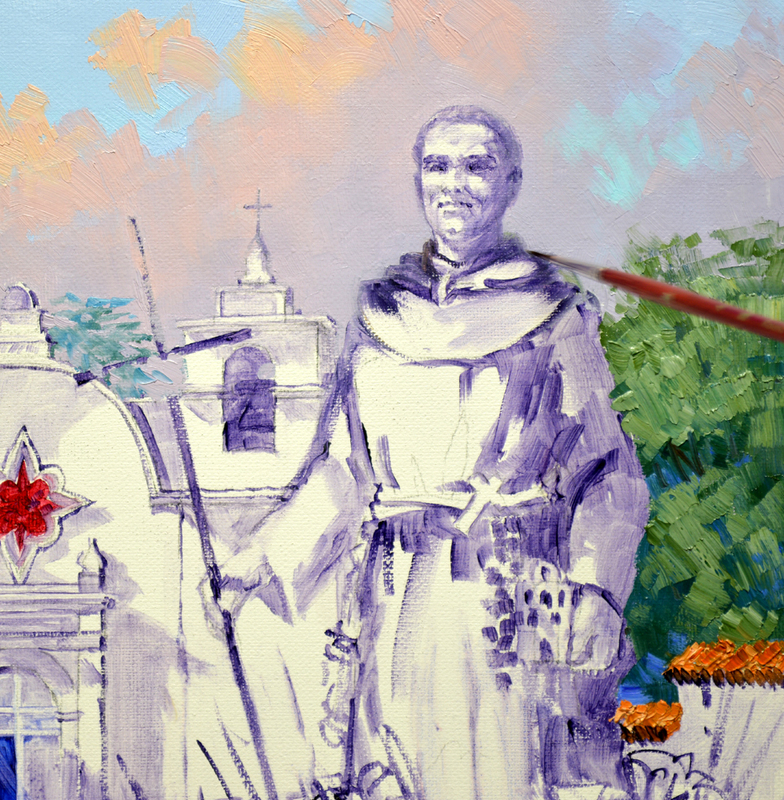 VIDEO DEMONSTRATION: Blocking in the face of Saint Serra. 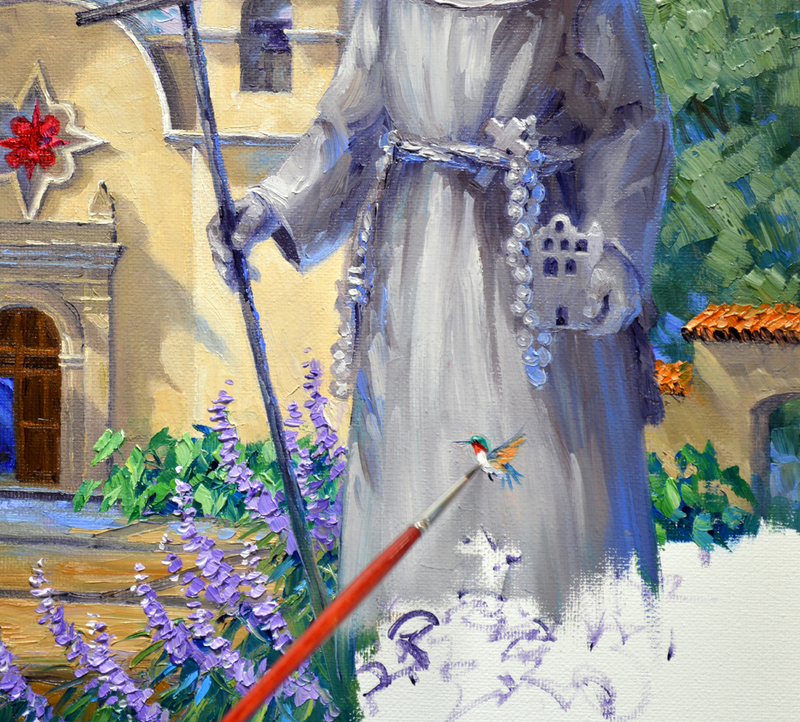 The basic block in of Saint Serra’s face is now refined. A fine liner brush is used to make the tiny details. You may click on the image to see it larger. 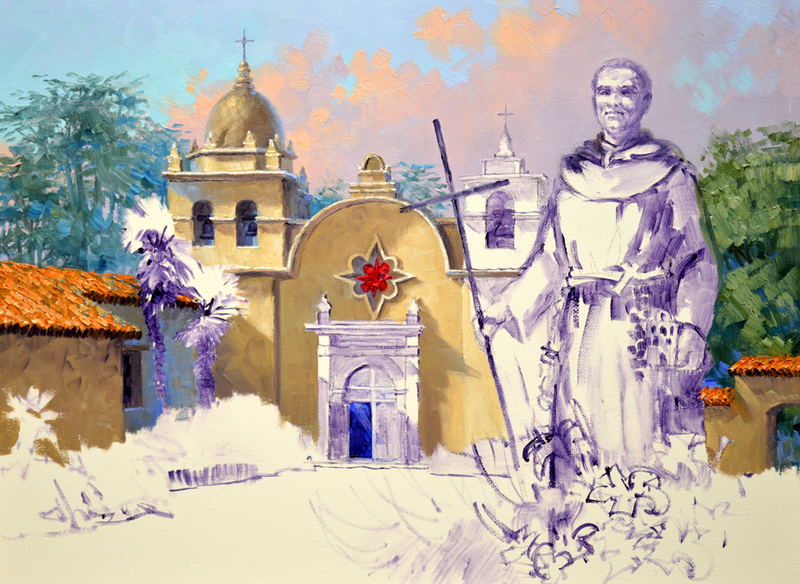 The Carmel Mission was the second mission that Saint Serra founded, Mission Basilica San Diego de Alcala was the first. 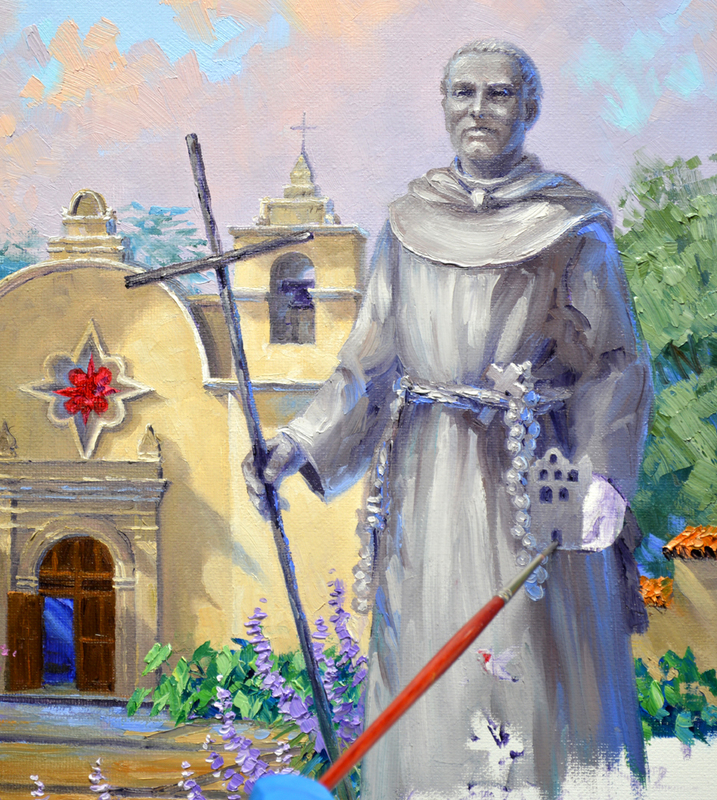 He holds a replica of one of the others he started, San Gabriel Arcangel. 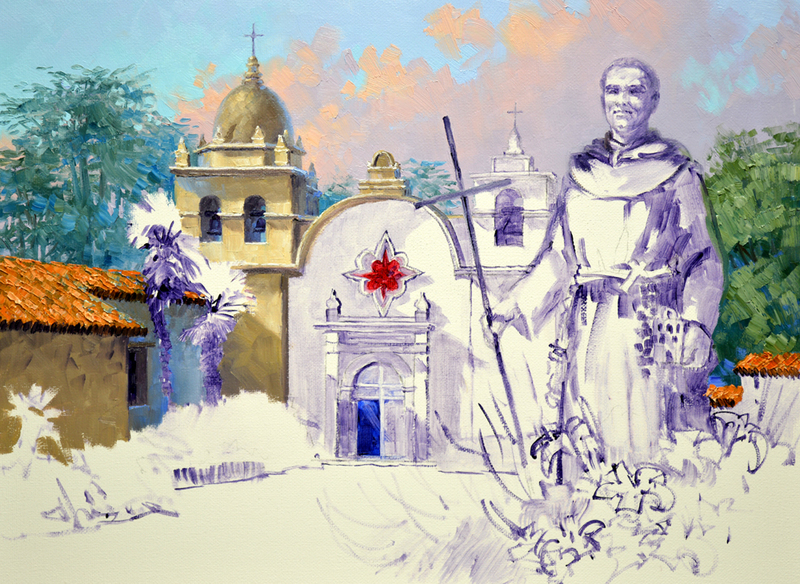 Established in 1771, it was the fourth of the nine California missions he set up. 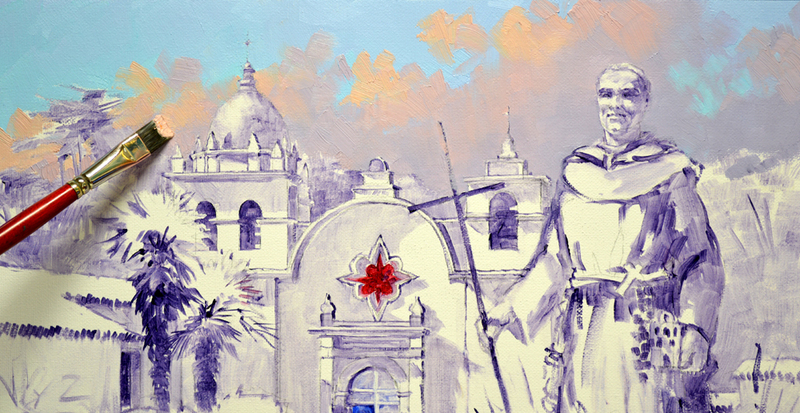 Eventually there were 21 in the entire chain of California Missions. Another Ruby Throat Hummingbird dances in front of the sculpture. Bright blooms of the Day Lilies are made of Cadmium Red Light + Alizarin Crimson, Cadmium Red Light + Cadmium Orange and Cadmium Orange. The long, strap-like leaves are mixtures of Pthalo Blue + Lemon Yellow. 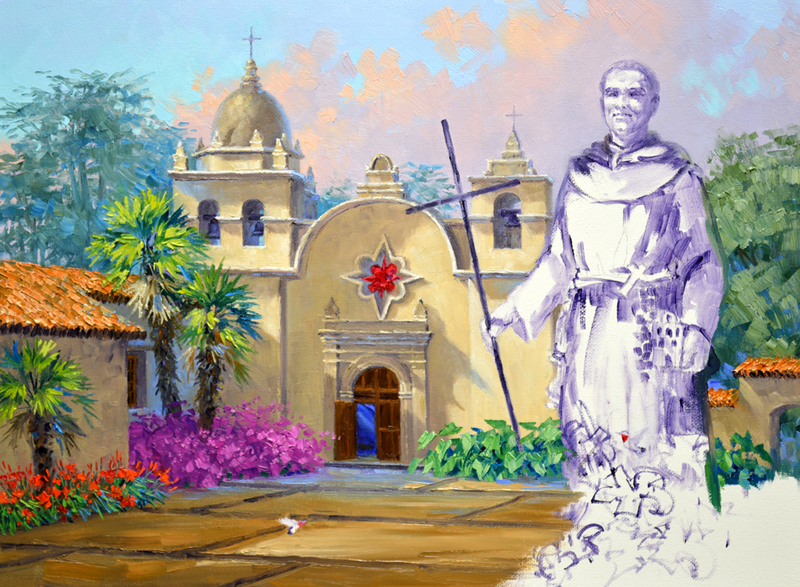 The Mission Window is finished. It’s a little bright right now, but I’ll wait until the painting is complete to worry about it. 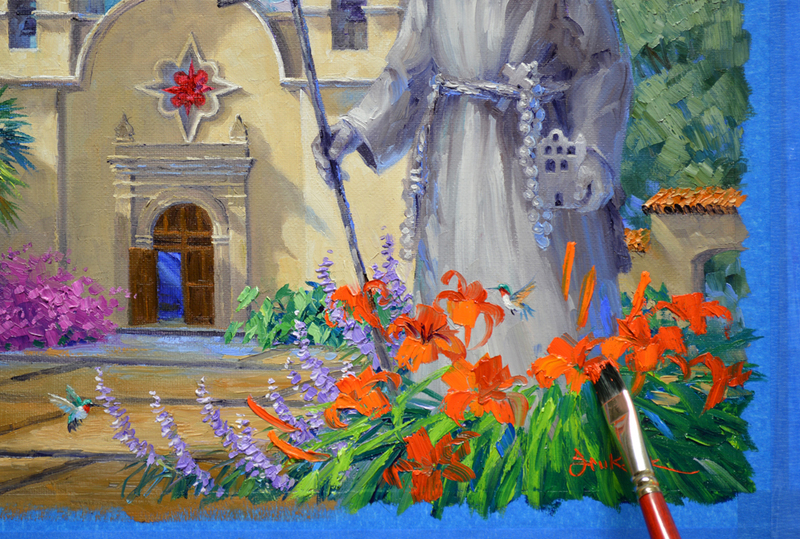 When all of the colorful flowers in the foreground are done the stained glass may not appear to be quite as brilliant. Please remember, you may click on the pictures to enlarge them. 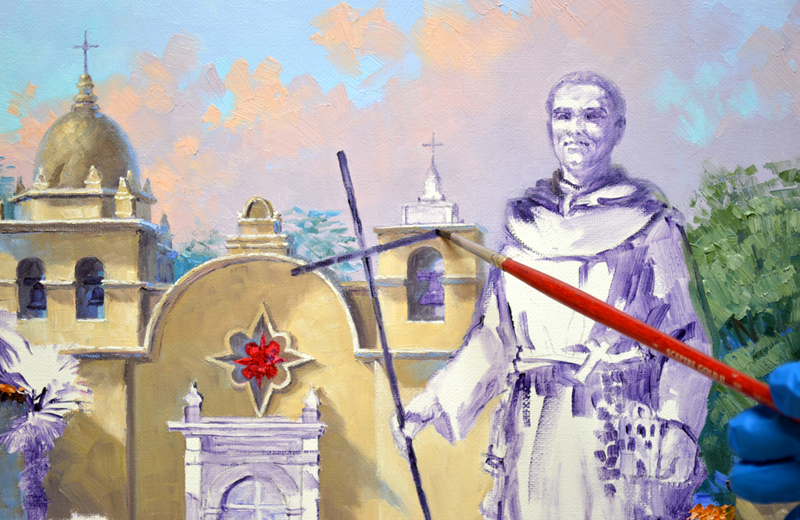 Saint Serra’s cross is delineated after the portion of the tower behind it is painted. Sunlight, pouring over the roof on the left, skips across the stonework of the columns and facade around the massive doors at the front of the sanctuary. Ed asked if I would add some Hummingbirds. This one will be sipping nectar from Salvia blossoms that are to grow here shortly. 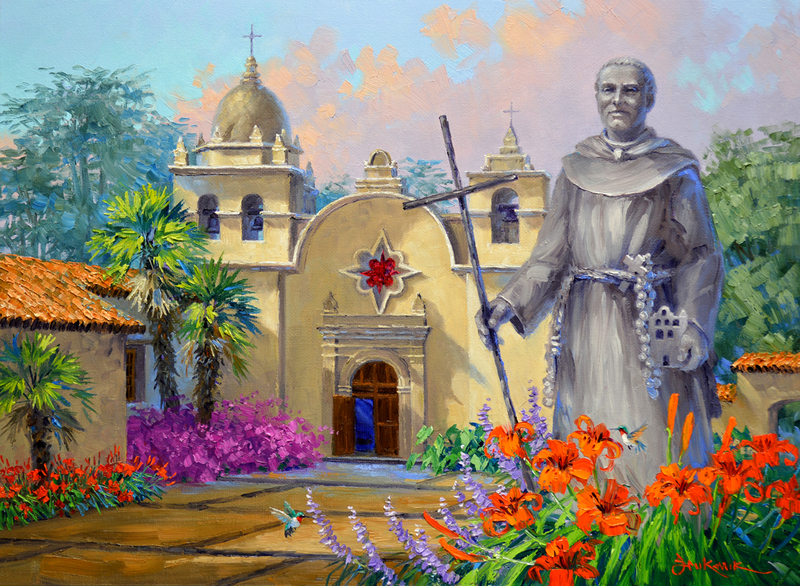 Magenta Bougainvilleas are planted at the base of the Palms in the far corner. 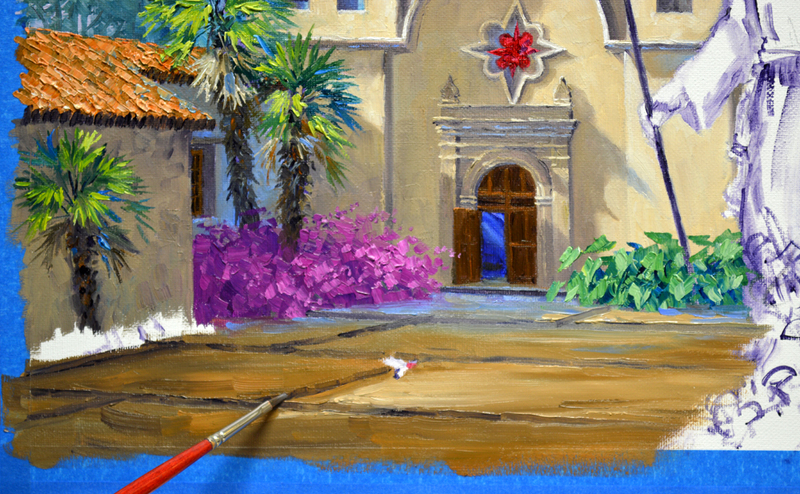 Then, working carefully around my sketch of the Hummingbird, I paint the light and shadow pattern on the courtyard floor. Inlays separating the large sections of the courtyard floor are drawn into the wet paint. 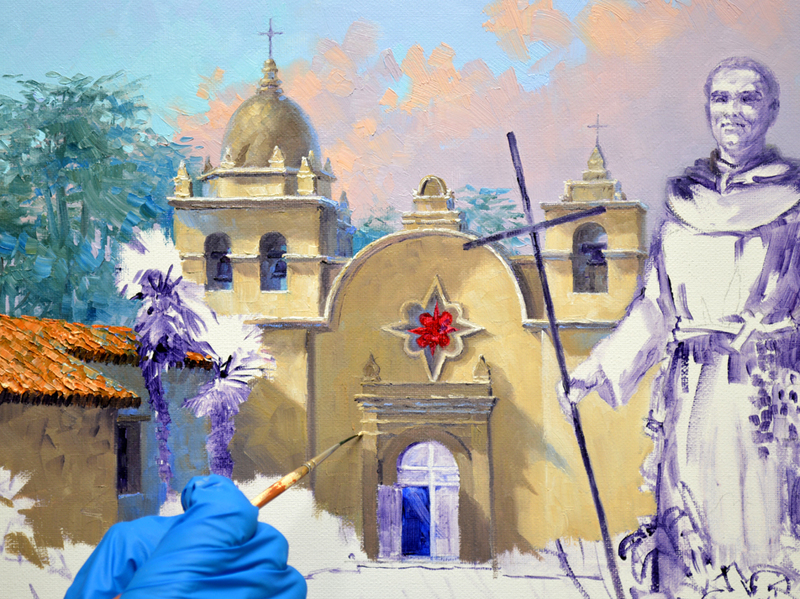 Application of opaque oil paint begins in the sky. 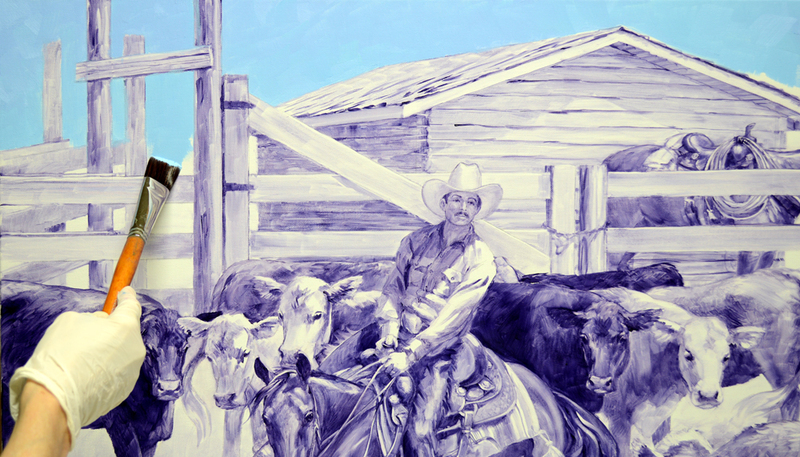 The blue field of the sky is painted with two mixes: White + Cobalt Blue and a lighter combination of White + Pthalo Blue. White canvas is left for where the clouds will be. 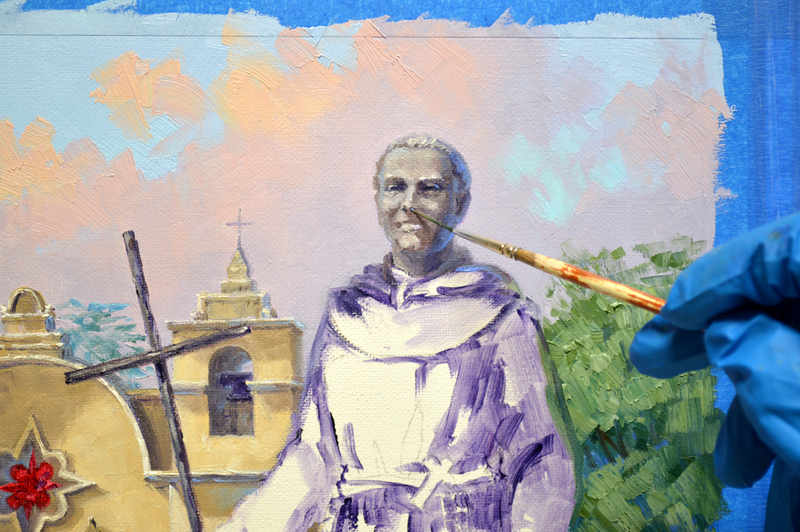 The shadow portion of the clouds is covered first with a mixture of White + MUD (2 parts Ultramarine Blue + 1 part Alizarin Crimson). Please keep in mind as you read through my blog, you may click on any of the images to view them larger. 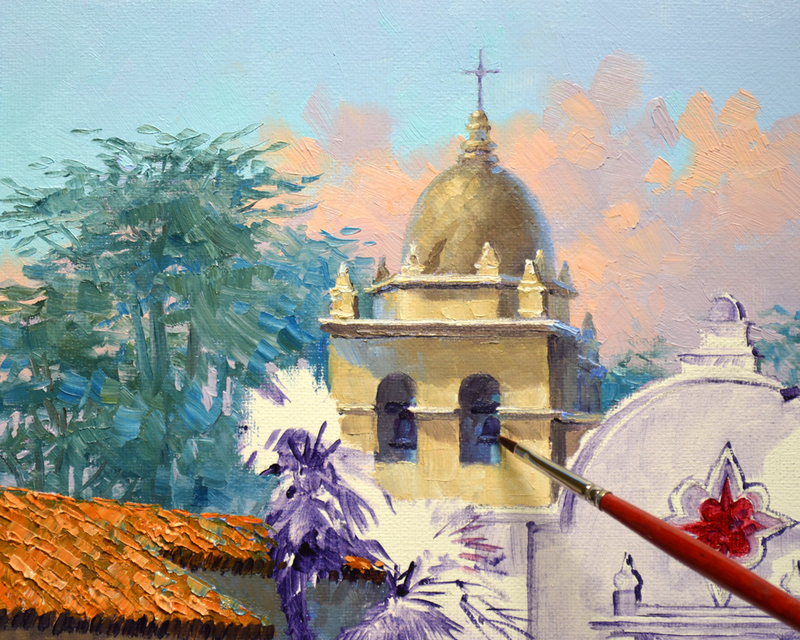 Highlights on the clouds are made of White + a touch of Alizarin Crimson + a bit of Cadmium Red Light. 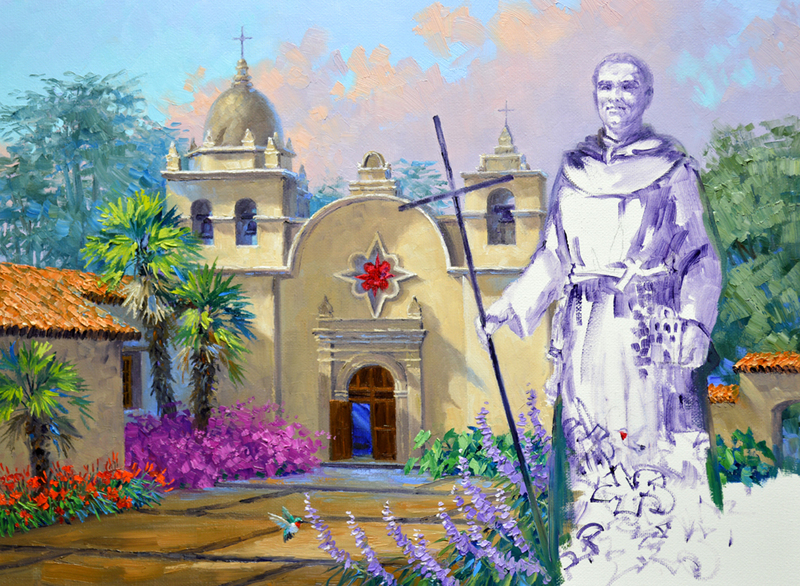 The Carmel Mission is very close to the ocean; many mornings the area is covered in fog. When the sun breaks through and the fog rolls back, the dissipating clouds are brushed with sun warmed pinks and oranges. While the sky is still wet I soften the edges of the sculpture in the foreground. This will help to give the feeling of “roundness” to the figure. The bells in the tower are different sizes, allowing them to peal in a variety of tones.